It speaks to the quality of the football that has been played so far this season by RB Leipzig that fans across Europe are looking beyond their contentious origins and being drawn in to following the club. Playing with a high tempo high pressing system based loosely around four lines in a 4-2-2-2 structure the side from the East of Germany have won fans and plaudits as they challenge the established hierarchy at the top of the Bundesliga. Not only is the style of play impressive but they have also implemented an overall strategy that has seen them build a squad full of young talents with the potential to develop far beyond their current level. The likes of Emil Forsberg, Naby Keita and Timo Werner in particular are already attracting covetous glances from the major clubs across the continent whilst in the likes of Oliver Burke there is evidence that the club are recruiting from areas not utilised traditionally by major clubs, the Scotsman Burke arrived from Nottingham Forest having made just a handful of first team appearances. The recruitment of the former Ingolstadt coach Ralph Hasenhuttl has also proven to be an astute one with the Austrian coach quickly implementing his own playing philosophy which lines up perfectly with that of sporting director Ralf Ragnick. Indeed, the start to the season was so impressive that many onlookers were waiting for the club to regress to the mean. A defeat at the end of the first half of the season to Bayern Munich seemed to foreshadow a drop down the table and on the resumption of play after the winter break their form remained inconsistent. That placed added importance on this match away to Borussia Monchengladbach (Gladbach) who would provide a stern test with their tactical system. RB Leipzig began with the Hungarian international Peter Gulacsi in goal behind a back four of Benno Schmitz, Stefan Ilsanker, Marvin Compper and Marcel Halstenberg. In midfield the impressive Naby Keita and Diego Demme filled the more defensive roles with Marcel Sabitzer and Emil Forsberg given more attacking licence. There was a rare start for Oliver Burke in attack partnering the young German Timo Werner. Burke showed his versatility throughout switching with Marcel Sabitzer as and when the match situation allowed. There was a definite sense throughout this match that despite being the away side were intent on taking the initiative as the match played out. The home team seemed content for the most part to sit in a relatively compact block in a 4-4-2 structure in their defensive phase. It was obvious from the outset that the home side were concerned about the pace on the counter attack from RB Leipzig and were looking to deny the opposition any space behind their defensive structure. Unfortunately, this meant that despite possessing attacking players such as Fabian Johnson and Andre Hahn who have genuine pace Gladbach were unable to transition effectively from the defensive phase to the attacking phase. As such they found themselves under large periods of pressure from their opponents. As you can see from the above image Gladbach have dropped in to a compact and passive 4-4-2 block with little pressure on Naby Keita in the RB Leipzig midfield. With this structure Gladbach are looking to prevent their opponents from playing through the centre of the pitch by denying RB Leipzig space in between the defensive and midfield lines. That has an obvious effect in that the opponents are allowed almost free reign of the wide areas which they can use to stretch the defensive block and penetrate in behind. On the other hand, RB Leipzig were extremely aggressive with their structure looking to press Gladbach back at every opportunity. 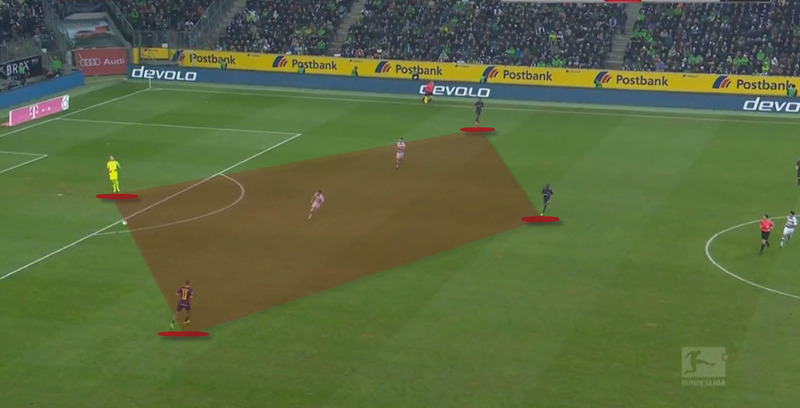 This started in the build-up phase where RB Leipzig would look to immediately advance their fullbacks in to the wide areas that were surrendered by Gladbach as the centre backs split and one controlling midfielder – usually Naby Keita – would look to drop in to receive the ball from the back. As Gladbach look to press the build up with their two attacking players who are isolated from the rest of the team structure we can see that RB Leipzig form a structure that gives them numerical and positional superiority. With Naby Keita dropping in he forms a flat diamond with three easy passing options for the man in possession of the ball. As the Gladbach attackers can only cover two of these passing lanes at any given time it is relatively easy for RB Leipzig to progress the ball up the field. Whilst the Gladbach defensive structure was well set up and compact it still struggled when RB Leipzig were able to access the wide spaces to pull defensive players slightly out of position. This coupled with intelligent movement in to small pockets of space within the defensive block allowed RB Leipzig to penetrate through in to the final third and set themselves to attack. Here is a clever example of the type of movement in tight areas that we saw as RB Leipzig worked their way up towards goal. The man in possession has two Gladbach defenders in close proximity looking to close him down and prevent any passing options. One of the central players for RB Leipzig then looks to run in and off the blind side of the covering Gladbach player to give a quick window in which the ball can be played between the two defenders and in to the space. At this point with the ball being played through the first line of pressure we see the Gladbach defensive line forced to adapt and shift to cover the threat. As the central defenders slide over it creates space centrally that Forsberg is eventually able to capitalise on as he scores the opening goal. 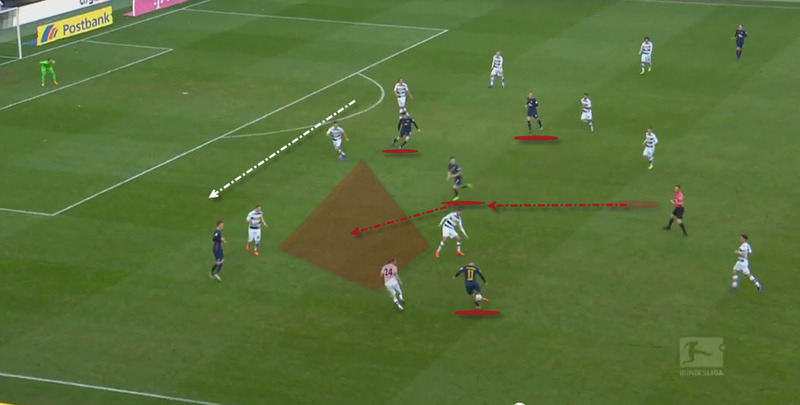 In this example the ball is in the wide area as RB Leipzig are looking to build in their attacking phase. This time the movement is relatively simple as the player occupying the wide advanced space simply moves back towards the man in possession, and in doing so drags his immediate marker out of position. This movement opens up space which is accessed by one of the central players moving from inside to out to take possession of the ball that is played over and in to the space that had been created. We have already seen that Gladbach struggled to transition from defence to attack given the nature of their defensive structure that was too passive we saw the opposite from RB Leipzig who were equally compact defensively but far more aggressive in their defensive actions. The layers within the 4-2-2-2 structure favoured this season by RB Leipzig mean that they are able to stay compact centrally whilst also shifting to press effectively should the opposition be tempted to play in to the wide areas. Here you can see Gladbach trying to build an effective attack from the back. You can clearly see the layers within the RB Leipzig structure with the two more advanced midfield players being positioned slightly wider than the deeper midfielders and attackers who play on similar vertical lines. The defensive structure is still compact but it is also flexible enough to deal with a variety of threats depending on how the opposition look to build their attack. Here you can see another example with Gladbach looking to advance play in to the advanced areas of the pitch. 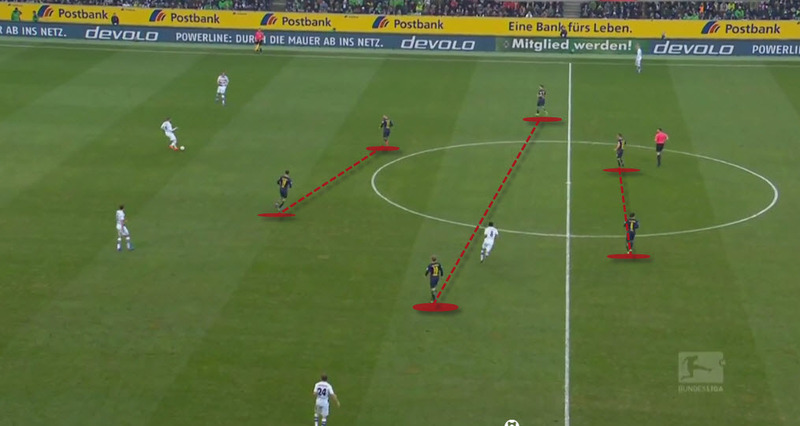 There is a pocket of space for Gladbach which one of the advanced players looks to access by dropping deep. The passing lane in to that player in space however is covered by the midfielder for RB Leipzig who is positioned to prevent the pass. In support Naby Keita will then drop across to prevent the space from being accessed through other means. This was a match that was important for RB Leipzig if they are to maintain their title challenge in the Bundesliga. There was a real danger that should they continue to drop points then Bayern in particular would pull away. It was also a match that further strengthened the argument that the side from the East of the country belongs at this level despite their relatively young age and the fact that they have only just been promoted. They continue to play a brand of attacking football that brings excitement to the league and which will continue to win then fans from without Germany. 2-1 flattered the home side who were largely outplayed. The way things are going we can expect to see RB Leipzig representing Germany in the Champions League next season.